BOTOX® Cosmetic is one of the most popular non-surgical cosmetic procedures in the United States! BOTOX® Cosmetic is a non-invasive cosmetic neuromodulator that is FDA-approved to temporarily improve the appearance of moderate and severe frown lines between the brows and crow’s feet lines. In men and women, the most prominent area for folds and wrinkles are creases found on the forehead, typically caused by years of frowning and squinting and wrinkles around the eyes due to aging. When skillfully injected, BOTOX® Cosmetic can temporarily reduce deep creases and wrinkles resulting in a more youthful, smoother and refreshed look. Why A Board Certified Dermatologist and Expert Injector? Trust your BOTOX® Cosmetic injections only with a Board Certified Dermatologist! BOTOX® Cosmetic is best performed by board certified dermatologists who are experienced, appropriately certified injectors. Dr. Rebecca Baxt and Dr. Saida Baxt are Board Certified Dermatologists who have performed thousands of BOTOX® Cosmetic injections and can help determine the best treatment for your skin and facial rejuvenation goals. A clinical study in JAMA Dermatology found that BOTOX® Cosmetic and filler procedures are very safe when performed by experienced board-certified dermatologists. Side effects occurred in less than one percent of recipients, and most of these were minor; such as, minor headache or bruising. Beware of low cost “Botox” providers as there is no “generic” form of BOTOX® Cosmetic. The formulations, potency, and approved doses vary among botulinum toxin products. This means that one product cannot take the place of another. 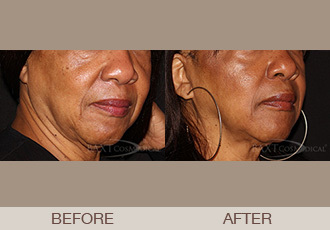 Make sure you are getting authentic BOTOX® Cosmetic. We receive our BOTOX® directly from the manufacturer, Allergan. There is a lot of artistic vision to injecting BOTOX® Cosmetic. You want a very experienced and properly trained injector, not someone who takes a weekend course, or injects in a salon, gym, or in homes. BOTOX® Cosmetic is an FDA-approved drug and is a medical procedure best performed by a licensed board certified dermatologist with expertise in the art of cosmetic medicine and NOT a nurse, physician’s assistant (PA), dentist or other type of non-cosmetic doctor. BOTOX® Cosmetic is comprised of tiny amounts of a highly purified botulinum toxin protein refined from the bacterium, Clostridium botulinum. BOTOX® Cosmetic works beneath the skin’s surface and targets the underlying muscle activity that causes frown lines and crow’s feet and prevent muscle activity and reduce the appearance of frown lines. BOTOX® Cosmetic is FDA-approved for use in the US since 2002. The safety and efficacy of BOTOX® Cosmetic have been evaluated by the manufacturer, Allergan in clinical trials and more than 417 peer-reviewed articles in scientific and medical journals. BOTOX® Cosmetic works beneath the skin’s surface; with precise injections Dr. Rebecca Baxt and Dr. Saida Baxt target the underlying muscle activity that causes frown lines and crow’s feet. Patients often worry about the losing the ability to show facial expression. When you are treated by a Board Certified Dermatologist who is trained in facial anatomy and is an expert injector you do not have to worry about losing facial expression. The main side effects of BOTOX® Cosmetic are bruising and an occasional headache. An extremely rare and temporary side effect is eyelid droop. Again, a medically and cosmetically trained dermatologist can minimize this risk. What Can I Expect During and After a BOTOX® Cosmetic? The injection process takes about 10 minutes. After BOTOX® Cosmetic you will be a bit puffy for about an hour or so, we will use ice in the office to reduce the swelling. * If there is a bruise, you will usually be able to use cover up to minimize it. We recommend “taking it easy” for the rest of the day after your BOTOX® Cosmetic treatment. In other words, no gym or exercising. Are there Alternatives to BOTOX ® Cosmetic? We also offer Dysport® and Xeomin® treatments at BAXT CosMedical®. Dr. Rebecca Baxt and Dr. Saida Baxt inform patients that these botulinum products work in a similar manner as BOTOX® Cosmetic. Both Dysport® and Xeomin® decrease facial muscle contraction, thereby minimizing and sometimes erasing lines and wrinkles. These products are effective in the upper face. We are pleased to offer Dysport® and Xeomin® to are cosmetic enhancement armamentarium to help you refresh your appearance and look younger fast! “Visit to Baxt offices has always been professional and courteous. Drs. Saida and Rebecca have always answered my questions and taken the time to listen to any concerns I have had. *”Joan S.
“The best, most thorough and most honest doctor ever. The staff and service is great. I have referred both family and friends with confidence that they will walk out of the office satisfied. *” Erin B. For Unmatched Expert Non-Surgical Facial Rejuvenation with BOTOX® Cosmetic, Contact Us Today!